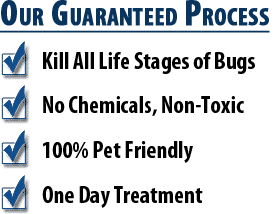 On this page we will answer the most frequently asked questions and answers about our bed bug pesticide/chemical treatments. If you still have a question that is not on here, feel free to give us a call at 623-888-8190 or send us an email. Where is the bed bug pesticide applied? Pesticides are applied to all areas where bed bugs can be found and targeted. These are the areas where you wouldn’t generally come in contact with pesticides. Unless you choose a bed bug heat treatment, it may take up to 30 days to eliminate all the bugs. This is because every bed bug must come in contact with our chemical before dying. How long does it take to apply bed bug pesticides? In most cases, pesticides can be applied to affected areas within an hour. Pesticides can take three hours to dry, during which you must remain out of your home. If your service included a bed bug warranty, then you are protected for the whole length of your warranty. If you see another bed bug during your warranty, we will come back and retreat at no additional cost. Is pesticide/chemical treatment effective for all infestations? 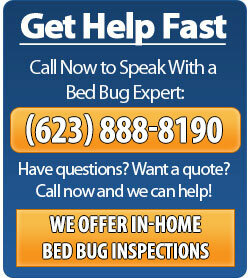 Bed bug pesticide treatments performed by us are highly effective for most levels of infestation. If you have had a serious infestation for years, then we may highly suggest a heat treatment. However, if you have a newly discovered or mild bed bug infestation, a chemical treatment is a very effective method. Are your chemicals harmful to my family and/or pets? Absolutely not. Once dried, our chemicals won’t harm your pets or family members. We require you to stay out of your house for the full three-hour drying period. People and pets should not experience any side effects from our pesticide application. How is the pesticide different from what’s sold online or in stores? Pesticides available in stores or online normally act as repellents which can actually do the opposite of eliminating your bed bug infestation. Improper use of pesticides, or the wrong pesticide, can also help the bed bugs in your home build a stronger resistance. Effective bed bug pesticides should only be purchased through reputable commercial pesticide dealers. They should also only be applied by licensed pesticide applicators to ensure the quality and your safety. Do you offer a guarantee for chemical treatments? For our bed bug chemical/pesticide treatments, we offer up to a 6-month warranty. 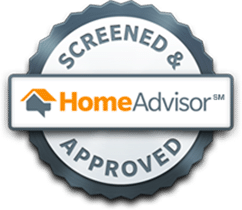 The guarantee covers all areas of your home. 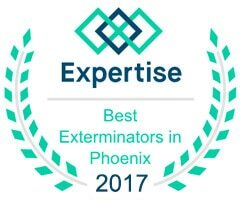 If you come across another bed bug during your warranty, give us a call and we will come back to retreat at no additional cost. 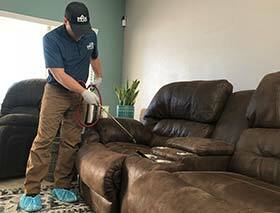 Our other treatment option, a bed bug heat treatment, comes with a one year warranty and a chemical spray is also included with all heat treatments. Does my family and pets need to be out of the house for treatment? Yes, whether you get a chemical treatment or heat treatment, you must remain out of the house for the duration of the treatment, including the three hour drying period after chemicals have been applied. There are no exceptions to this, it is for your own safety and health. Will the pesticide damage any of my belongings or property? No, pesticide treatment does not pose any risk of damage any of your belongings or property. Whether you go with a chemical or heat treatment, we will provide prepataion instructions. My bed bug treatment question isn’t on here – what should I do? If you still have a question that is not listed on here, feel free to give us a call at 623-888-8190. This is the best way to contact us. You can also send us an email.